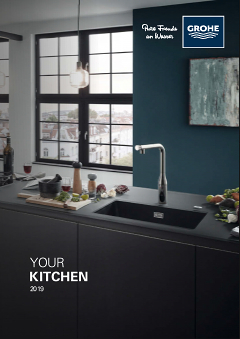 This GROHE Eurosmart kitchen tap is presented in GROHE StarLight chrome, lending it an alluring sheen and making it effortless to maintain. Just one of its handy features is the GROHE EcoJoy technology which caps your water use at 5.7 litres per minute, even at full flow. The GROHE SilkMove cartridge lets you vary water temperature and flow with ease and precision. And the separate internal waterways mean you will enjoy pure, clean drinking water free from impurities. If you have a small kitchen then the 140° swivel action is especially handy, allowing you the necessary range of movement but stopping the spout from bumping adjacent cupboards or walls. A built-in temperature limiter and an ergonomically designed lever round off a tempting proposition. It's all you could possibly want in a kitchen tap.